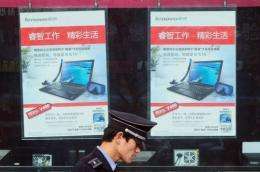 A security guard passes adverts for laptop computers in Beijing. US legislators have accused Canada, China, Mexico, Russia and Spain of "robbing Americans" by failing to crack down on piracy of movies, music, videogames and other copyrighted works. US legislators have accused Canada, China, Mexico, Russia and Spain of "robbing Americans" by failing to crack down on piracy of movies, music, videogames and other copyrighted works. Theft of intellectual property in the five nations was at "alarming levels," the Congressional International Anti-Piracy Caucus said Wednesday, placing them at the top of the "2010 International Piracy Watch List" for the second year in a row. The caucus, made up of 70 members of the US House of Representatives and Senate, said it was "greatly disappointed by their failure to make meaningful progress during the last year" in protecting copyrighted works. "We are losing billions and billions of dollars because of the lack of intellectual property protections," said Senator Orrin Hatch, a Republican from Utah. "These five countries have been robbing Americans." "Unfortunately, the United States is on the wrong end of the greatest theft of intellectual property in the history of humankind," said Senator Sheldon Whitehouse, a Democrat from Rhode Island. "This must be stopped, and soon." The bipartisan caucus, citing industry estimates, said global piracy costs US firms over 25 billion dollars in lost sales annually. The US legislators also released for the first time what they called a "list of notorious offenders" -- websites making available unauthorized copies of the works of US creators. The websites singled out were China's Baidu, Canada's isoHunt, Ukraine's MP3fiesta, Sweden's Pirate Bay, Germany's Rapidshare and Luxembourg's RMX4U. The caucus called on US trading partners to "take action against websites based within their borders whose business models are premised on delivering infringing content." Mitch Bainwol, chairman and chief executive of the Recording Industry Association of America, which represents major record companies, said the "websites facilitate massive theft" and "undermine legitimate commerce." "The question for us globally is 'Can we create a world in which the Internet becomes a place of order rather than a place of chaos?" he asked. Representative Adam Schiff, a Democrat from California, said pressure needs to be brought to bear on US banks and credit card companies whose services are being used to pay for pirated material on "rogue websites." "We not only have to put pressure on these countries that are tolerating piracy or encouraging piracy but we also have to put some pressure on companies here at home that are helping facilitate piracy," Schiff said. "We need to dry up that revenue stream as part of the attack on those sites." "This includes companies like Visa and Mastercard that facilitate financial transactions on these sites," he said. The caucus said Canada is a "leading host" of illegal file-sharing sites and its "enforcement record continues to fall short of what should be expected of our neighbor and largest trading partner." "At one point in 2009, five of the world's top 10 illegitimate 'bit torrent' sites were registered, located, or operated out of Canada," it said. In China, "copyright theft is viewed in some sectors of the economy as a legitimate strategy for Chinese competitiveness," the caucus said. "This must end." Microsoft cited piracy as a major reason that the US technology giant's software revenue per personal computer purchase is 15 times greater in the United States than it is in China. "We have a particular problem in China in our business, which is that piracy is sky high," Microsoft boss Steve Ballmer told a gathering of corporate chief executives on Wednesday. Mexico is a leading source for illegal camcorder copies of US films, the caucus said, and "piracy of hard goods and unauthorized use of software also remain severe problems." The caucus said Russia has made "inadequate progress in addressing Internet piracy" and needs to adopt "updated and uniform procedures for investigation and prosecution of copyright infringement." As for Spain, the caucus said it hopes the Spanish government will move quickly to tackle peer-to-peer piracy. "Greater accountability and deterrence must be established in Spanish law," it said. Canada is a protected nation under NAFTA Part II, China on the other hand is and has always been a haven for economic dissidents.